Organizations enable businesses and open-source projects to collaborate on packages using a single nuget.org identity. For a package consumer, an organization account appears same as an existing user account on nuget.org. Your user account is your identity on nuget.org and can be a member of any number of organizations. A package can belong to an organization account like it can belong to a user account. Package consumers don't see any difference between an user account or the organization account: both appear as package owners. An organization account has one or more user accounts as its members. These members can manage a set of packages while maintaining a single identity for ownership. On the next page, provide the organization name and email address. Since organization accounts share the same namespace as user accounts, the organization name must be different from any other existing organization or user accounts. The email address must also be unique across all accounts. Once the organization account is created, you are the administrator and can submit packages for the organization and add organization members. Account conversion is irreversible: you cannot transform an organization back to a user account. 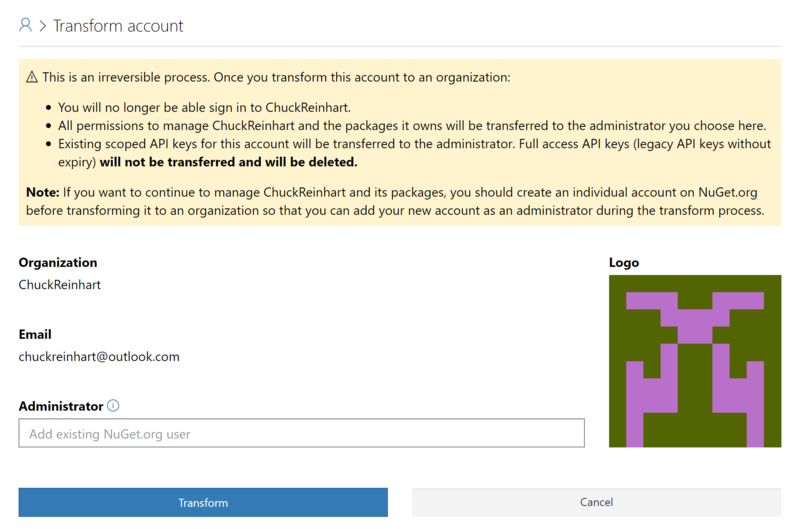 On the next page, specify different user account to assign as the administrator of the organization, then select Transform. You can view all the packages across your account and all organizations of which you're a member on the Manage Packages page. To view the packages specific to your account or any specific organization, use the accounts filter on the top right of the page. If you wish to transfer some of your packages to a newly created organization, you can do so by requesting the organization account to co-own the package and then removing yourself as the owner. If you are an administrator of the organization, there is no confirmation required to accept the ownership. However, if you are a collaborator, adding the organization as an owner requires one of the administrators to accept the ownership. 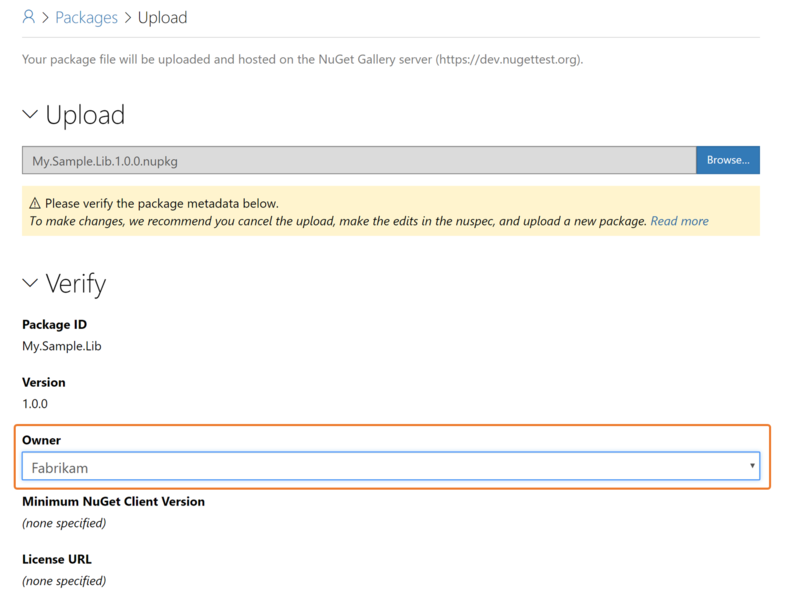 You publish packages to an organization like you publish packages to a user account: by directly uploading the package to nuget.org or by pushing the package through the nuget push or dotnet nuget push CLI commands. To push a package through the nuget push or dotnet nuget push CLI commands, you must obtain an API key needed by those commands. For details, see Publish a package. Administrators can remove any member from the organization, including other administrators. If you're the sole administrator for an organization, you cannot remove yourself unless you add another member as an administrator.